Thoughts on Bird Watching: 2014 Winter Bird Count, Carter County, Tenn.
2014 Winter Bird Count, Carter County, Tenn. I have a hard time imagining this. Sometime in the middle of World War II, in the small, mountain town of Elizabethton in the hills of Tennessee, interested citizens, hobbyists and professionals, took the time to survey birds in their city. And many, many more interested citizens have continued that event for 72 years? The 2014 Winter count for Carter County is in the books. The search area is a six-mile radius centering on Elizabethton, Tennessee, broken into six count areas. We rotate through each area every year to give the crews some variation. Our group (Joe McGuiness, Kim Stroud, Kathy Noblet, Vern Maddux, Charles Moore) drew Wilbur Lake and the farm lands around it. Wilbur Lake this time of year is usually awash with ducks. We had only three species of water fowl there: Canada Goose, Bufflehead, Mallard. Any other day or any other year we would have had Widgeon, Canvasback, Redhead, Ring-neck, Grebe, and a few others. The other common sighting is European starling. We had over 2,000 this time which is not all that uncommon. I have a few starling in my yard and neighborhood. Yet out on the count they were shoulder to shoulder for thirty or forty feet at a time on the wires. Our group had only 50 species. The total for the club was 69. The average for the last thirty years (three US census periods!) is 71. The club fielded six parties totally 25 spotters. Twenty-five folks who took off their Sunday to brave 20-30 degree temperatures to count birds. That is pretty darn neat! Comments welcome. Use the "anonymous" profile. Thanks. 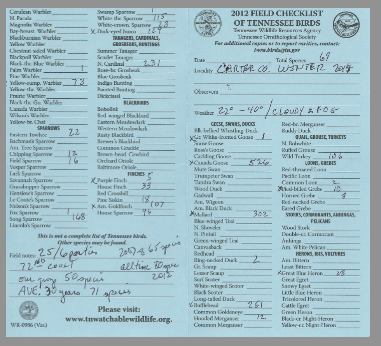 Spring Bird Count, May 2014.